The video, recovered from the bus's black box, shows a female passenger arguing with the bus driver and smacking him in the head with her cell phone as they cross over a bridge in the city of Chongqing. Four passengers, who got off earlier, confirmed that a medium-height woman had quarrelled with the driver because she missed her stop, local police said. During the fight, Ran lost control of the bus and the vehicle broke through a guardrail and plunged into the river with an estimated 15 passengers on board in Wanzhou, Chongqing. 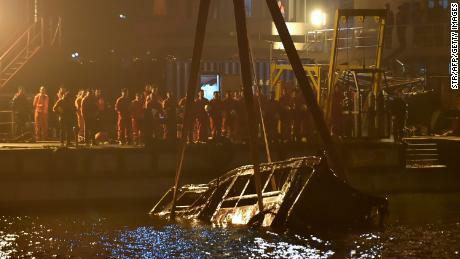 Rescue workers and boats on the site where a public bus plunged into the Yangtze River after colliding with a auto in Chongqing, China on Oct 28, 2018. However, Liu did not get off and later asked the driver to stop the bus when she realised she missed her destination. The driver turned his head back several times during the argument. The driver took his right arm off the steering wheel and fought back. Thirteen bodies have been pulled out of the river, but two remain missing. Rescuers lifted the wreck of the bus from the river on Wednesday night. Police said on Friday, Nov. 2, 2018, a brawl between a passenger and a bus driver was the cause of the bus plunging off a bridge and killing more than a dozen people in southwestern China on Sunday.